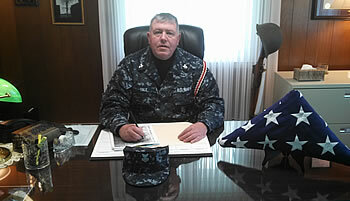 A retired 20-year veteran of the United States Navy, William (Bill) Yale has served as director of the Sampson Veterans Memorial Cemetery in Romulus, N.Y., since July 2011. An Upstate New York native, Yale is a graduate of the Simmons Institute of Funeral Service in Syracuse and presently a student of Funeral Administration at SUNY Canton, with a Dec. 2014 graduation date. Yale has practiced as a licensed funeral director in New York State, and previously served as the Cemetery Representative at Bay Pines National Cemetery in St. Petersburg, Fla., He was also a licensed minister and Associate Pastor at Kibler Road Church of God in Van Buren, Ark. Yale entered the U.S. Navy in September 1977 and retired in March 1999 as a First Class Parachute Rigger. A Cold War Era veteran, he served on the USS Nitro AE-23, embarking on two Mediterranean deployments. He also served on the USS Nassau LHA-4 and was deployed to Beirut in 1984 and later, to the Arctic Circle; the USS Tripoli LPH-10 during the Gulf War in 1991; and the USS Inchon LPH-12 for NATO North Atlantic mine-clearing operations. Additional duty stations included: Helicopter Anti-Submarine Squadrons HSL-32 and HSL-34 at Naval Air Station in Norfolk, Va.; Helicopter Anti-Mine Warfare Squadrons HM-14 and HM-16, also at Naval Air Station in Norfolk; Naval Air Technical Training Centers in Millington, Tenn., and Pensacola, Fla., where he served as an Aviation Survival Equipment Instructor and Military Training Instructor. Medals awarded include three Navy Achievement Medals, an Armed Forces Expeditionary Medal (for Beirut, Lebanon), Kuwait Liberation Medal, a Southwest Asia Medal, National Defense Service Medal, and four Good Conduct Medals. Ribbons earned include the Navy Unit Commendation (Operation Desert Storm), Meritorious Unit Commendation, three Navy Battle E ribbons, as well three Sea Service Deployment ribbons. Yale was also inducted into the Royal Order of the Blue Nose while serving aboard the USS Nassau LHA-4 while crossing the Arctic Circle. Yale was born in Wilkes Barre, Penn., grew up in Honeoye Falls, N.Y., and is a graduate of Honeoye Falls-Lima High School. Bill has four children, William, Randall, Robert & daughter Lindsey. He currently resides in Romulus, N.Y. Yale is a member of the Veterans of Foreign War Post #6200 in Ovid, N.Y., and American Legion Post #463, also in Ovid, N.Y., Marine Corps League Detachment# 486 and holds membership in the N.Y. State, & Finger Lakes Funeral Directors Associations and N.Y. State Cemetery Association.